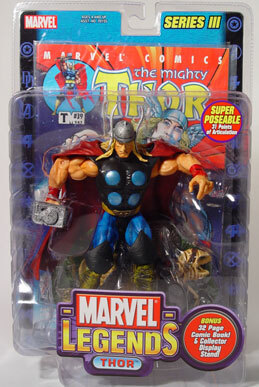 November 27, 2002 - RTM is proud to present another advance look at Marvel Legends Series 3 action figures. 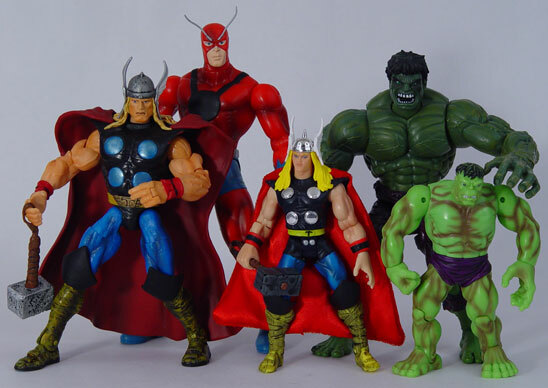 We just received the figures from Toy Biz and we have carded shots and one loose image of the group. We will be writing a complete Spotlight feature on Series 3 early next year to better coincide with the actual release date for these toys. Marvel Legends Series 3 will consist of five figures and one variant when it reaches mass-market release. 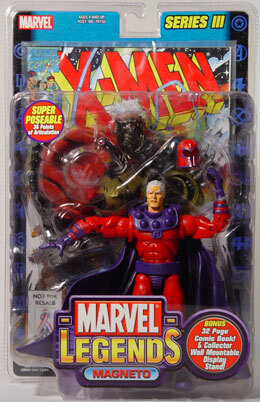 Thor, Magneto, Ghost Rider and Wolverine (with a variant) have been seen before as prototypes, and the fifth figure will be Daredevil styled in the costume for the Daredevil movie, set for release in February 2003. 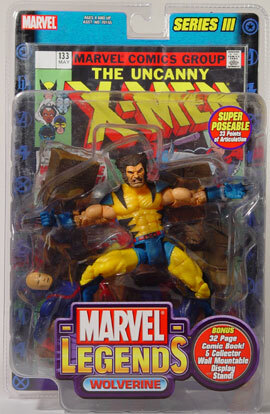 The Daredevil figure was not included with this set, but we do have a look at the variant unmasked Wolverine figure. Numbers for the variant are unavailable at this time. All figures are packaged with full-length comics reprinting issues where the appropriate character is spotlighted. For the samples sent to RTM the following re-print issues were included - Wolverine (both versions) Uncanny X-Men #133, Thor - The Mighty Thor Vol 2 #39 (or Vol 1 #541), Magneto - X-Men #2, and Ghost Rider - Ghost Rider Vol 2 #2. 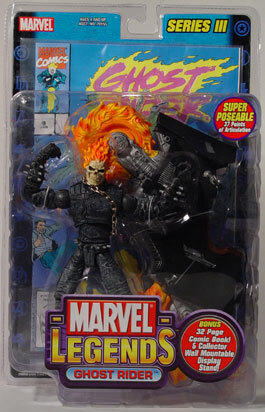 The imagery on the package (and in the comics) suggest that the issues for Magneto and Ghost Rider may be different, with Magneto shown with Magneto Rex and Ghost Rider shown with Marvel Knights Ghost Rider #2. We will report which versions will be see in the mass-market versions once that information is available. We will also check to see if the Daredevil figure will include a comic or not. All the figures continue the popular Marvel Legends line introduced this year by Toy Biz, with high levels of sculpting and articulation. The packaging marks the articulation as follows - Ghost Rider - 37 pts, Thor - 31 pts, Wolverine - 33 pts, Magneto - 36 pts. All figures come in clamshell packaging and feature highly detailed wall-mountable bases. Release dates are set at January/February 2003.